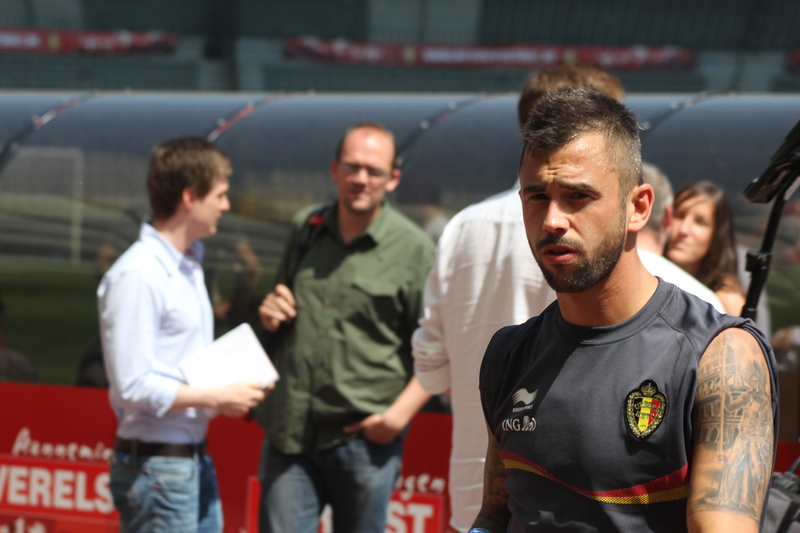 Steven Defour – out of the Anderlecht side for a few weeks. There are just two rounds of games to go in the Belgian championship before the season really starts with the playoffs. I’ve written many times about the system that’s disliked by the majority of clubs, punters and players. Here I’ll focus on the football side of affairs. With the points gained in the classic season being halved before the playoffs start, it’s usually tight at the top. Last season, Guy Luzon’s Standard Liège had a 10 point lead over Anderlecht, saw it reduced to five overnight and then watched as Besnik Hasi’s boys pegged them back by season-end. Overall, Anderlecht have won four of the five ‘playoff’ seasons to-date. The only time they missed out was 2010-11 when Genk, featuring Kevin De Bruyne and Thibaut Courtois took the title by a half of a point from Standard. This season is likely to see the ‘Big Five’ (Anderlecht, Club Brugge, Gent, Racing Genk and Standard) all qualify for the playoffs. This hasn’t happened since 2011-12 due to Gent having a bit of a blip and six coaches in two seasons. Anderlecht were favourites for the title when this season began but their performances in the league have disappointed in comparison to their European displays. Youri Tielemans has not quite measured up to expectations, although he is only 17, but Dennis Praet, Aleksander Mitrovic and Chancel Mbemba have all excelled. Leander Dendoncker has also been rolled off the production line and has impressed in midfield. He’s had the chance due to injuries; Praet has yet to return and Steven Defour is again out for a few weeks. Timmy Simons – captain of Club Brugge (copyright John Chapman). I didn’t think Club Brugge would be good enough for a title challenge this time around but Michel Preud’homme has proved me wrong. He’s put together a strong squad – although not as talented as Anderlecht’s – and he’s got everyone pulling in the same direction. They’ll miss chief playmaker Victor Vazquez who will be out for about half of the playoff games through injury. One strength has been that goals have come from a bunch of players with seven of the squad scoring four or more to-date. A major worry for Preud’homme is that they’ve started dropping points in recent weeks and their lead at the top is fast disappearing. At the beginning of the season, Standard were welcoming Tony Watt and saying goodbye to Imoh Ezekiel. Since then they’ve moved Watt on to Charlton Athletic and seen the return of Ezekiel on loan; he’s now the highest paid player in Belgium. Despite sacking two coaches, Standard have somehow managed to put together a long unbeaten run and are currently the league’s form team. As usual, no one knows what the future will bring to Sclessin. 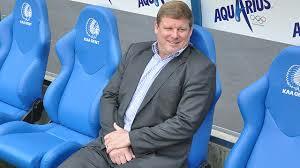 Gent have acquired some stability with new coach Hein Vanhaezebrouck, who has moved over from Kortrijk. He’s showing what he can do with a little money and excellent facilities. Gent will be hoping for European qualification and Vanhaezebrouck will be the man who deserves the credit. The team is currently on an eight-match unbeaten run with Moses Simon scoring heavily since his arrival in January. Over at Racing Genk, Alex McLeish has hardly covered himself in glory but if he makes it to the playoffs, the Genk management will be happy. Genk have prospered by ‘parking the bus’ and have the best defensive record in the league. Veteran Thomas Buffel is doing a good job for McLeish and in defence, keeper László Köteles and centre back Christian Kabasele have been consistent. Kortrijk, under Yves Vanderhaeghe have exceeded all expectations and should just edge out Felice Mazzu’s Charleroi from the playoffs. Mazzu in particular is forging a good reputation and if Charleroi make the playoffs, it would be the first time for the Carolos.The only other club with an outside chance of qualification is Lokeren. They’ve been in the top six for three of the last four seasons but coach Peter Maes is probably in need of a new challenge. One problem with the playoffs is that clubs that fail to make the top six – the next eight at least – are condemned to play interminable matches with little meaning and hardly any spectators. The ‘prize’ will be a two-match playoff with the club finishing fourth in the main playoffs, with the winner gaining entry to the Europa League (playoffs). The bottom club – currently Lierse – will then play the team in 15th place – Mouscron at the moment and on a run of 10 successive defeats – five times! The winner of those matches will go into another series of round robin games with three clubs from the second division. Such is life. The loser will be relegated. Going into tonight’s games – all to be played at the same time – the positions are: Club Brugge 55 points, Anderlecht 54, Gent 51, Standard 50, Kortrijk 47, Charleroi and Racing Genk 46, Lokeren 41. The main games today will be: Club Brugge-Charleroi, Genk-Zulte Waregem, Gent-Lierse, Lokeren-Anderlecht, Kortrijk-Cercle Brugge and KV Mechelen-Standard. Next weekend’s final matches will feature: Anderlecht-Gent, Standard-Genk, Charleroi-Mouscron, Lierse-Kortrijk, Westerlo-Club Brugge and Beveren-Lokeren. Go to the Jupiler League site for full fixtures.